Click Here to Transfer Home Movies to DVD and / or files. Secure your memories for yourself & future generations. Copysmith scan photos, 35mm slides & negative film to disc or file for permanent safety & retrieval. Why Choose Copysmith for CD Duplication? You have your CD ready for duplication so you now find someone who can copy the disc, print on the surface, produce the paper print and package in the case for you. There seem to be a number of companies out there who can do this so why choose Copysmith? Perhaps a little history may help you decide why Copysmith is the best choice for you. Summer 1984, school was out and the entity that would become Copysmith was taken to a room in St Albans, UK instead of lazing around in the sun. Here were huge machines named autoloaders. Copysmith was told to keep them stacked from the top and to empty them at the bottom. 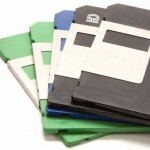 These autoloaders were copying 8″ floppy disks. Copysmith learned there were other sizes of disks as well. Jumping forward a few years with school out of the way Copysmith embarked upon a copying career. 8″ disks were now obsolete but 5.25″ and 3.5″ disks were very much where the world was at. By the early 1990’s CDs were beginning to take hold and a move to Ireland in 1998 to work for an American Corporate who manufactured packaging for CDs and DVDs proved to be a wise move. Clients included Microsoft, Sony DADC, Technicolor, Avarto, MPO plus many other replicators. A Switch to the inventing company of this particular packaging followed later with interim periods selling duplication equipment, services and packaging. Finally in 2015 Copysmith took a new form. A solo project. 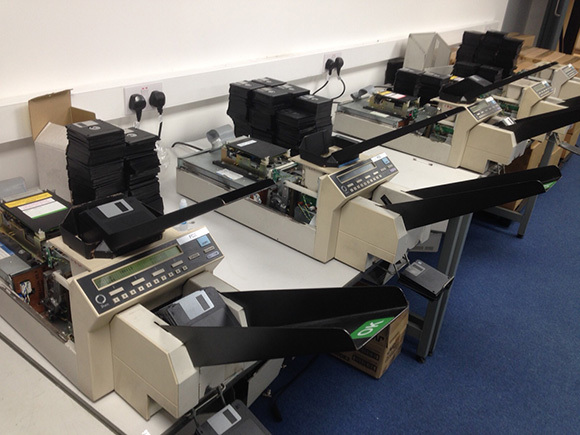 With over 30 years experience of copying, packaging, machine sales, service sales all based in the media duplication industry Copysmith was no longer a merely a Handle. It was now an organisation. As with all new ventures things took time to take off. With knowledge gained over the years on online marketing and a range of other service including cine film and video conversions, audio tape and cassette conversion plus photo and slide scanning the Copysmith services portfolio grew and grew. With vinyl records making a come back Copysmith decided not only to provide a service for manufacture of 100 units up but also a low volume service where one off vinyl records could be ordered for presents, presentations, promotion etc. The first months saw a steady increase in sales and gave a basis for further growth during 2016 and 2017. This allowed further investment in our equipment, software and processes. To service our duplication requirements we now have 3 tower units that between them provide us with18 duplication drives which allows for outputs of upto 400 CDs per hour. All of these drives produce CD and DVD whilst 3 of these drives will also produce Blu-ray. Our on disc printing is catered for by Epson Disc Publishers which also give a further copying drive option if required. The prices displayed include delivery across Ireland and VAT and are subject to Copysmith’s Black Friday offer only which starts Monday 21st November 2016 and ends Friday 2nd December 2016 at 5:00pm. All orders must be placed, and payment received, during this period to avail of the offer prices. Turnaround is 7 to 14 working days. Quantities of 1,000 may be supplied as CD-ROM or DVD5 “pressed discs”. All other quantities are written CD-R and DVD-R discs. Lead times run from receipt of masters and artwork and / or approval of masters and artwork / receipt of payment, whichever is the later. DVD discs will be required to be converted to an MPEG2 encoded format to be play on domestic DVD players. MPEG2 DVD discs will also play on computers. MP4 files will not play on all DVD players. An extra charge of €15 including VAT is charged to convert from MP4 to MPEG2 DVD. This service of free for quantities of 300 x DVD or over. Card Wallets, CD & DVD may be printed matt or gloss – please indicate on the form to the left. Do cut out the centre hole in the artwork – we will do this. Please be aware of the centre hole’s position and do not place any text etc. across this as this section will not print. Be sure to remove the template from the final artwork. Our preferred format for artwork is 300dpi PDF files but we can accept, tiff, EPS, Illustrator, Photoshop etc. at 300dpi. Please make sure you remove the template from the final artwork. The please complete the form in the first column. Upload your audio or MP4 files with your artwork by clicking here. Do not upload MPEG2 DVD masters. We insist on a physical master for MPEG2 DVD . Complete your payment on receipt of the PayPal payment request we will send your email address. PayPal is a secure method of clearing major credit cards. If you do not wish to pay via PayPal, please indicate the method you wish to pay on the form in the first column. We will send you information of the chosen payment method via email. Once payment is received we will send approvals to you via email. On receipt of your approvals and payment we will commence with your work. On completion we will notify you of the despatch date and the delivery date. Please note all deliveries will take place Monday to Friday between 0900 and 1700. If you wish to have your delivery sent to an alternative address, please let us know and we will be happy to arrange this. All materials, files and images presented to Copysmith must be free of copyright, or you must be the copyright holder, or have the permission of the copyright holder to reproduce their material. The onus is with you, the client, and Copysmith accepts no responsibility for copyright breach in any manner whatsoever. Any breach of copyright will be answerable by the client only and Copysmith will seek recompense in any action taken against Copysmith, or any of it’s sub-contractors, or the sub-contractor may take action of their own, concerning this matter. It’s simple. Use your own music (no covers please), your own video and your own pictures and everybody’s happy! C’mon You Boys in Green ! Sip from your own Euro 2016 Irish mug while you enjoy the feast of football available from June 10th to July 10th 2016. Ireland play their first game against Sweden on Monday 13th June. 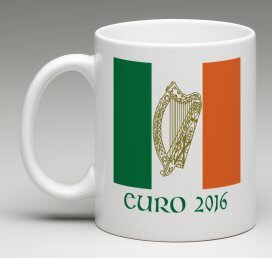 If you’re not lucky enough to be in France, get ready for the game, put the kettle on, and make your tea in this Irish Harp Euro 2016 mug! This is not official merchandise. Euro 2016 Irish Harp Mug 11oz Ceramic Mug printed with Irish Tricolour and Harp Dishwasher and Microwave friendly ! Get ready for your cuppa in June.